The Dolphin Browser for iPhone, iPod Touch, and iPad app contains enhanced social sharing features, quick access to bookmarks, and gesture controlled interface with the free iTunes AppStore download. You can update Facebook, Twitter, and email from within the Dolphin Browser iPhone app, as well as bookmark and download content easily to Evernote and Box. You can also sync the Dolphin Browser across your devices and PC for an integrated digital experience. The Dolphin Browser iPhone app incorporates graphically intriguing introductions that are described in four screens and easily navigated by horizontal swipes. The information is concise and displayed in an engaging manner. 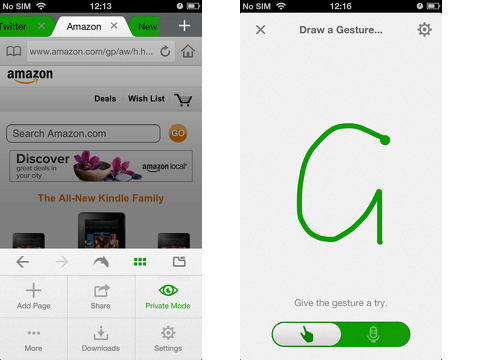 As you use the Dolphin Browser iPhone app, pop-ups will explain the gestures to maximize your experience quickly. The browser interface is an interesting mash-up of Google, Windows 8, and Safari. The top menu bar has a search bar to type a url in the middle. In the upper left, you will find your bookmarks. In the upper right, you find your home icon. The top of the screen has a Google search bar. The majority of the screen is filled with a grid of circle icons. 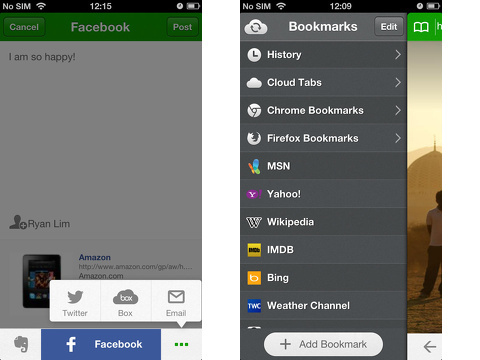 These icons give you one touch access to free apps, Facebook, Amazon, Twitter, and YouTube. You also have a chance to customize your home screen in order to add preferred URLs–called “Speed Dials” in the Dolphin Browser iPhone app. You touch the plus icon on the screen, then a new screen appears. You add a name and URL, and a circle is added to your home screen for speedy access. To search the internet using the Dolphin Browser iPhone app, you can type a URL, scan a QR code, or enter a simple Google search. When you touch the URL field in the top of the screen, the QR code icon pops into the left corner. You can continue to manually enter your search, or you can scan a code. You can also enter a simple Google search into the appropriate field just below it. As you check out pages, they remain open until you shut them. They can be accessed by swiping to the left or touching the pages icon in the lower right hand corner of the screen. The bottom menu bar of the home screen gives you a chance to access Dolphin’s truly unique features. The dolphin icon reveals the interface to create and use gesture controls. There are several gestures integrated, but you can create your own. To go to the bottom of a web page, you make a v in one continuous motion on your screen. If you want to move straight to Amazon, then you make an a on the screen. The gestures are agile and accurate. You can add voice recognition software integration with $.99 in-app upgrade as well. Those features are also accessed by touching the dolphin icon. Additional tools are available by touching the grid icon in the bottom menu bar. You can surf in private mode, save to Evernote or Box, share to Facebook and Twitter, and download content for offline viewing. The Dolphin Bowser for iPhone, iPod Touch, and iPad integrates successful features and gestures into an intuitive, unexpected package. AppSafari review of Dolphin Browser was written by Jenni Ward on July 31st, 2013 and categorized under App Store, Bookmarks, Fun, iPad apps, Productivity, Universal, Utilities. Page viewed 4253 times, 3 so far today. Need help on using these apps? Please read the Help Page.